Gail Hovey, and Charles Cobb Jr. Published by Africa World Press. Order through this website at $25.50 (15% discount)! Alphaeus Hunton: Why Worry about Africa? Peter and Cora Weiss: "The Atmosphere of African Liberation"
The following text is excerpted from No Easy Victories for web presentation on noeasyvictories.org. This text may be freely reproduced if credit is given to No Easy Victories. Please mention that the book is available for order on-line at http://www.noeasyvictories.org and http://www.africaworldpressbooks.com. Photo: The Vukani Mawethu choir, from Berkeley, visits South Africa in 1997. Photo courtesy of Vukani Mawethu. For me, as for many other American activists, the historic April 1994 election in South Africa was the culmination of decades of political work and dreams. Personal connections had already made that country a part of my life. 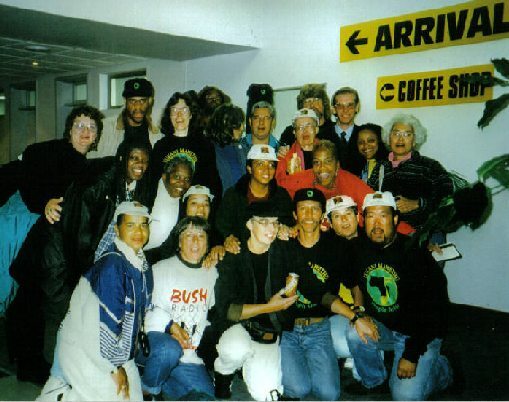 Now I was traveling to South Africa as part of a delegation from California's Bay Area with the mission to support the campaign of the African National Congress and its partners in a tripartite alliance, the South African Communist Party and the Congress of South African Trade Unions (COSATU). Our delegation included, among others, Fran Beal, Nesbit Crutchfield, Arla Ertz, Gerald Lenoir, and Essie Mormen. Linda Burnham, then and now director of the Women of Color Resource Center in Oakland, had coordinated planning for the group. We arrived in South Africa a few days before the election to find the atmosphere charged with tension. I worked with COSATU-supported candidates in Germiston, just outside Johannesburg. Each day we drove between meetings in Johannesburg, voter training in the East Rand, and COSATU events throughout the Johannesburg region. Several days before the election a bomb exploded in the taxi rank near our offices. My first thoughts were whether any of my COSATU comrades--Disco Chigo, Joyce Kgoali, Elizabeth Thabete, or Godfrey Tsotetsi--had been killed. But the election was held. Thabete, Kgoali, and Tsotetsi were elected to office, the ANC won an overwhelming victory, and our delegation celebrated along with millions of South Africans and supporters around the world. Even as we were celebrating, however, it was already clear that we would face new questions about our work with South Africa and the African continent and how it related to our communities back home in California. Nesbit Crutchfield and I had known each other for 25 years, going back to our common involvement in the San Francisco State University student strike of 1968. Others in our delegation had come to the Bay Area later and had become part of the movement currents that brought together local and community issues of racism with internationalism built on antiracism, anti-imperialism, and Pan-Africanism. For all of us, South Africa was viscerally linked to our lived experience of racism at home. Personal contacts and common struggles had made the African continent and the trans-Atlantic connection part of our lives. By 1994, the connection between our work at home and our work abroad was not in question. But would the spirit of activism that energized support for the Southern African liberation movements carry over to the new challenges of Africa in the 1990s? How should we set our personal priorities and strike a balance between coping with family and community issues at home, finding ways to connect to a new South Africa, and delving into areas and issues we were not familiar with--Rwanda, Nigeria, Liberia, Somalia, HIV/AIDS and more? How could we educate ourselves and help educate a new generation of activists for the period ahead? The answers to these questions were not obvious. In the 1970s and 1980s, the liberation struggle in Southern Africa resonated with our own experiences and memories from the civil rights movement and with our continued experience of racial affronts at home. Now the issues required a different understanding and analysis of African history, and of political and economic realities. After 1994, we had no choice but to look for new directions. As I talked to my fellow activists about the decade of the 1990s, everyone acknowledged that conditions had changed. There was no ready formula for what to do next, at home or abroad. There were, however, common convictions: that our consciousness of the trans-Atlantic connection should not be allowed to fade away; that new ways must be found to confront abuses to human dignity in Africa, at home, and around the world; and that the victories of the years of solidarity were real, however great the problems that remained to be confronted. The movement we were a part of, all were convinced, had made its own indispensable contribution to African freedom. The San Francisco State student strike in 1968 was the first major action demanding that Third World studies be offered at a large U.S. institution. It was also the first big leap in my consciousness about Africa. I was already a member of the Black Panther Party chapter in Marin City, north of San Francisco, and the Black Panther newspaper frequently carried stories on liberation struggles in Guinea-Bissau, Namibia, South Africa, and Mozambique, as well as in Asia and Latin America. At San Francisco State, the Third World Liberation Front, a political union of Asian Americans, Latin Americans, and African Americans, was at the forefront of the strike organizers. We were demanding changes in staff, curriculum, and recruitment policies. The strike was a bitter one, and some of us went to jail for our participation in civil disobedience. The strike made a clear connection between what was happening on our campus and what was happening in Africa. We knew of the visits to Africa by SNCC members and by Malcolm X. Malcolm's two historic visits to meet key leaders on the African continent in 1964 cemented our notion of a connection between our struggles. The film The Battle of Algiers, which first appeared in 1965, was shown repeatedly on campus, and we read The Wretched of the Earth by Frantz Fanon in study groups. It was a time of Black Power and of a new international consciousness. For me, as for Nesbit Crutchfield, who later worked in community organizing and youth counseling in Marin County, international connections and local struggles became inseparable. In addition to his local work, Crutchfield visited Cuba with the Venceremos Brigade in 1979 and 1982. There he found Africa as well as Latin America to be high on the agenda for solidarity with world revolution. For my part, I transferred to the University of California at Berkeley and was fortunate to participate in a summer study program in Ghana in 1971. This was another giant leap in my consciousness about Africa. By the end of that summer I was convinced that this would be the first of many trips to the continent; Africa would be central to my vision for the rest of my life. As I continued my studies and local community involvement after returning from Ghana, I worked on layout and editing for the Black Panther newspaper, with a strong emphasis on international affairs. It was not only black community activists who were involved in support for African liberation. The Liberation Support Movement was based among white leftists in Oakland, Seattle, and Vancouver, Canada. Founded in 1968 by Don Barnett, an anthropologist from Iowa who had studied the Mau Mau in Kenya, it included Ole Gjerstad from Norway and Chantal Sarrazin from Quebec, as well as Americans. It played a key role in bringing information from the liberation movements to all of us. The 1976 Soweto uprising in South Africa first brought Africa to the forefront for many in the United States, and the decade following Soweto was the high point of Africa solidarity work in the Bay Area, as elsewhere. Nesbit Crutchfield became intensely involved in support for the liberation struggle in Zimbabwe, working with a local group spurred on by the presence of Tirivafi Kangai, a Zimbabwean who studied at Berkeley and became the ZANU representative in the United States. Both Crutchfield and I were part of Bay Area coalitions on Southern Africa, which focused particularly on South Africa after the independence of Zimbabwe in 1980. Ida Strickland and Belvie Rooks of the Third World Fund were among the leaders developing a support base for this work, often providing the resources to host liberation movement representatives. The Data Center in Oakland, an international research center that initially focused on Latin America, provided a home for the Africa Resource Center, which I helped found and directed from the late 1970s through the late 1980s. The resource center maintained a library and organized public events. California Newsreel in San Francisco became a key distribution point for films on the liberation struggle, serving schools, churches, and solidarity groups around the country. The Bay Area became one of the pacesetters for action against apartheid, and we had a national impact through networks such as our trade union activists and public officials. We also hooked into national networks, using information, for example, from the national Stop Banking on Apartheid campaign. Miloanne Hecathorne, working out of the local offices of the American Friends Service Committee, spearheaded a campaign that targeted the California-based Bank of America. The Vanguard Foundation, founded in 1972 in San Francisco, consistently made anti-apartheid work one of its priorities. Led by Hari Dillon and Danny Glover, it was one of the steady influences fostering a link between national and international issues around racism, social justice, gender equality, and human rights. One of the key communications vehicles for the movement in the Bay Area was Pacifica radio station KPFA, where Faraha Hiyati started a regular radio program called Africa Today in 1977. I took over that slot two years later and have continued to host the program ever since. The program covered the African diaspora as well as events on the continent, allowing me to follow the ups and downs of Africa work in our community. Chapter continues on pages 189-200. Order book. This page is part of the No Easy Victories website.